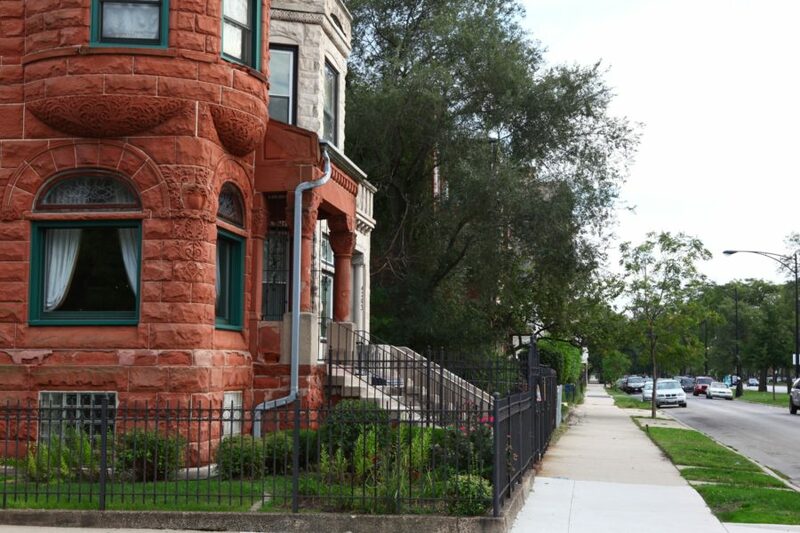 The area around 43rd Street and Dr. Martin Luther King Drive in Bronzeville has a rich cultural and architectural history, and we’re going to look at it in three parts. Our first stop on this journey is a stretch of grand greystones. 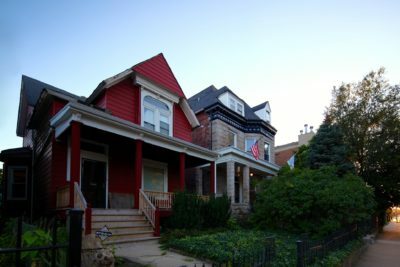 While many of the grand South Side homes have been razed over the years, this tract has some remarkably intact examples. 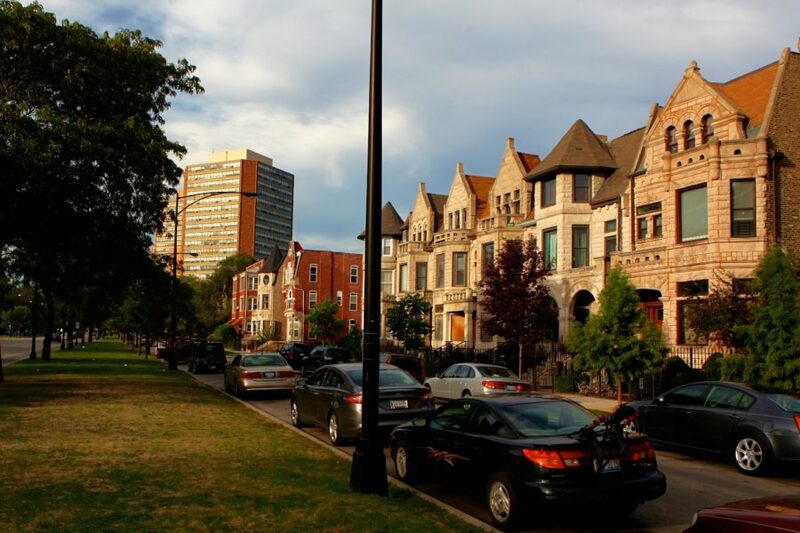 Bronzeville enjoys a rich history as the “Black Metropolis,” a primary destination point for blacks migrating from the south from the turn of the 20th century to the 1930s and 1940s in search of opportunity. 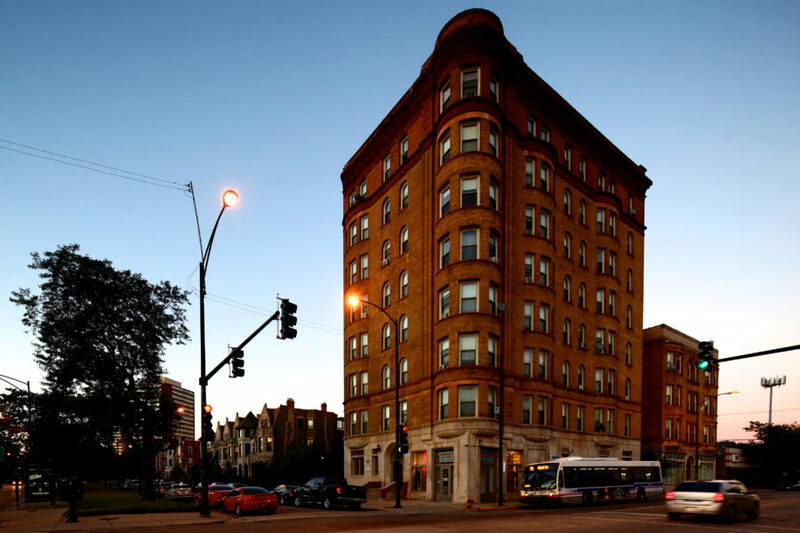 Denied housing elsewhere in the city and with limited access to downtown stores and other opportunities, blacks created a vibrant community around a strong, local consumer-driven economy and a large number of attractive entertainment venues. 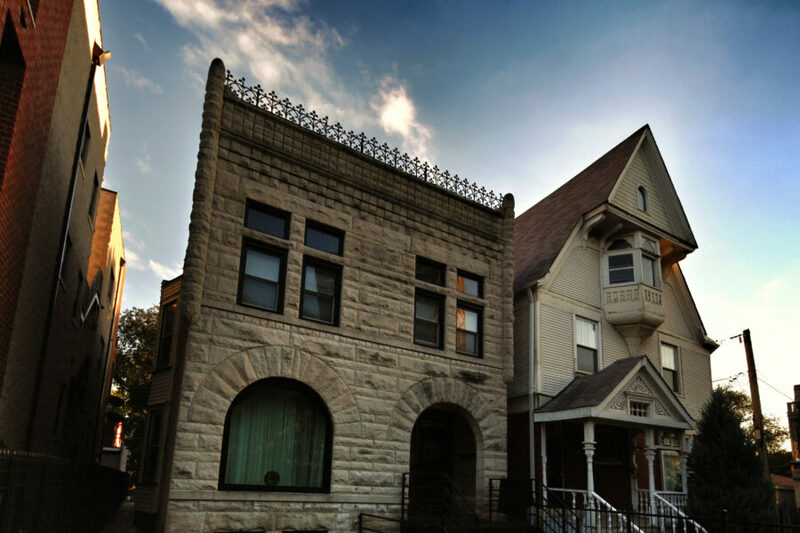 Bronzeville’s fortune began to decline in the 1960s and 1970s. With the elimination of restrictive housing covenants, middle class blacks followed the broader societal trend to the suburbs. 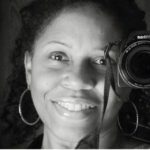 At the same time, local businesses lost many of their customers to well-capitalized downtown and suburban competitors that were newly opening their doors to black patrons. Let’s start the journey and peek into the past. 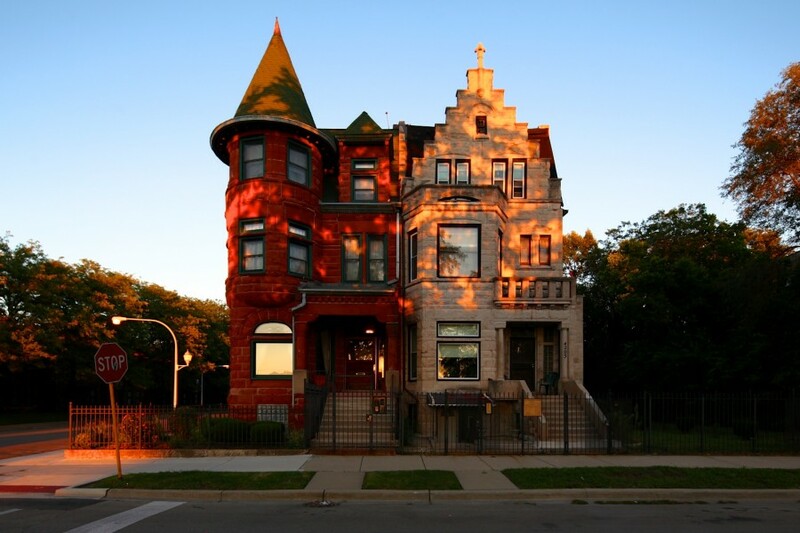 To get started on this walking tour, take the Green Line and exit at the 43rd Street station. Upon exiting the platform, look east toward the lake and you’ll see Belmonte Flats in the distance on the corner of 43rd and Martin Luther King Drive. 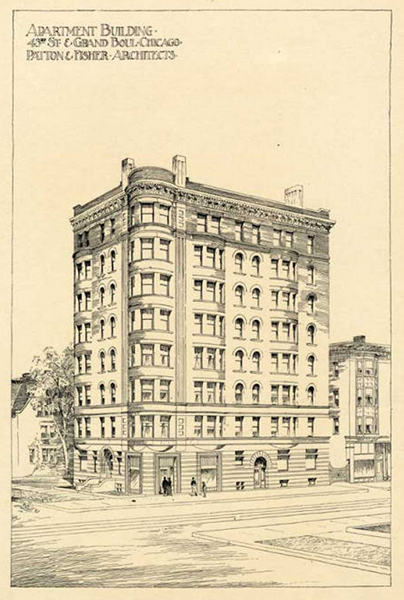 The print above was from an 1893 issue of Inland Architect, naming Patton and Fisher as architects. It was added to the National Register of Historic Places in 1998. 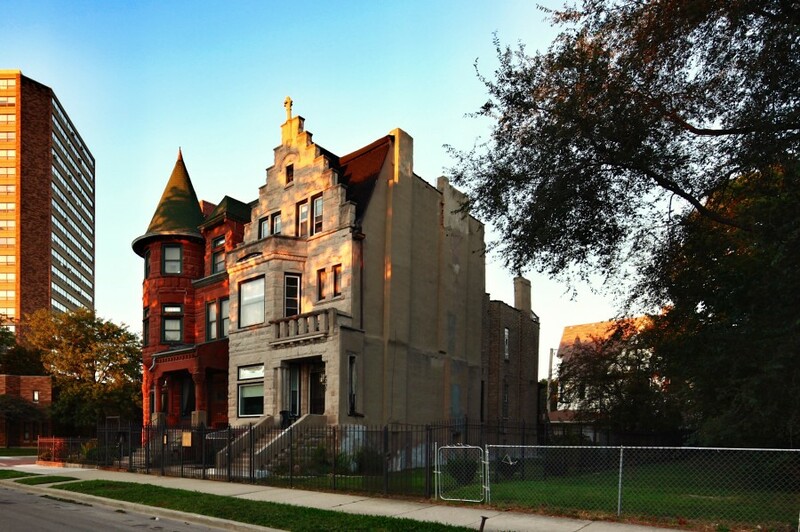 Turn left on Dr. Martin Luther King Drive and head north toward the stately row houses a few feet away. 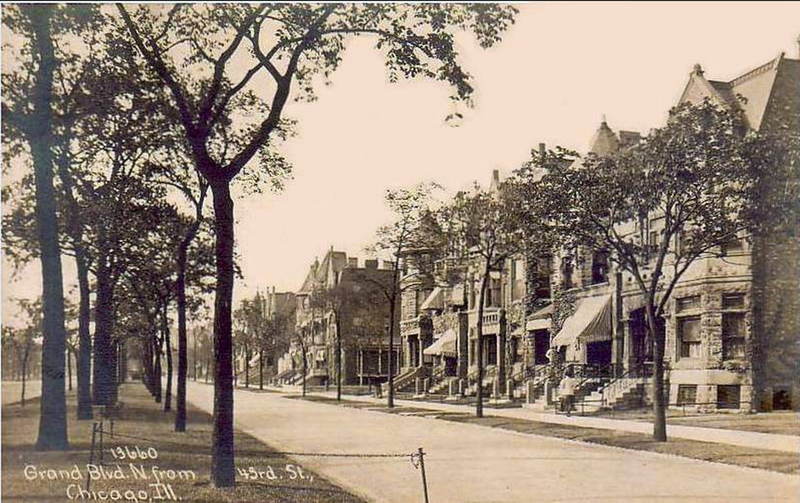 Among the many photographs from Chuckman’s Collection is this circa 1910 view of a tree lined street on what was then called Grand Boulevard (now Dr. Martin Luther King Drive). 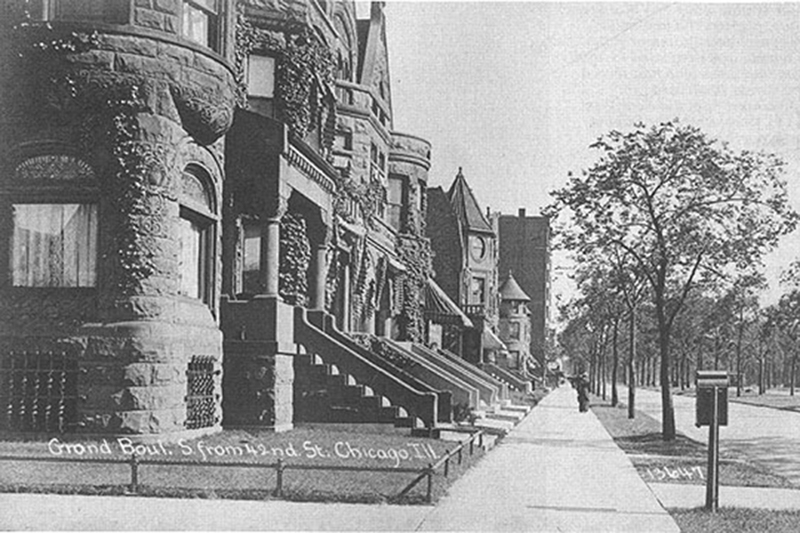 This is one of the few stretches of land in Bronzeville that looks strikingly similar to the way it was more than a century ago. 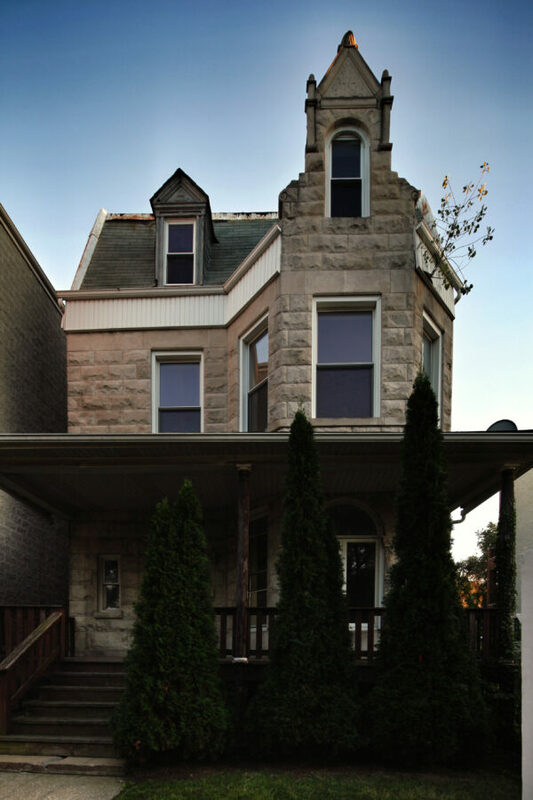 Built in the Romanesque Revival style, these greystones feature dramatic front gables, rough limestone, arched windows, and short columns. 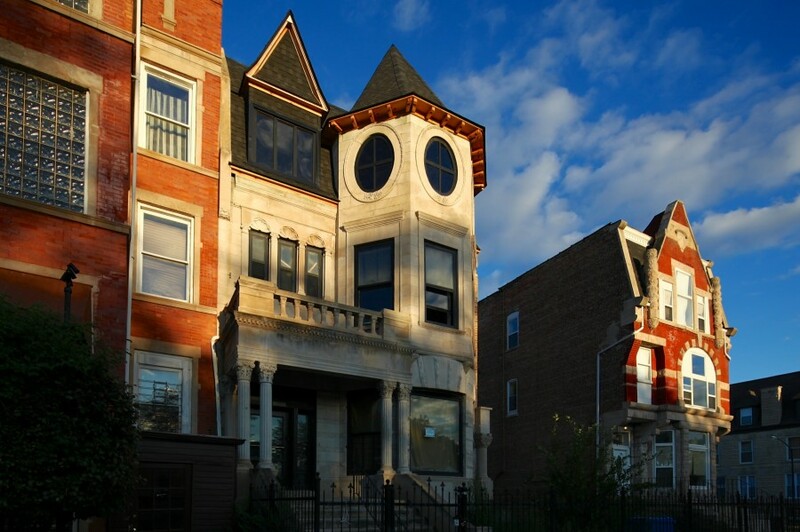 This was the first style in the evolution of Chicago greystones. Queen Anne varieties came a little later, before transitioning to Neoclassical and Beaux Arts styles. 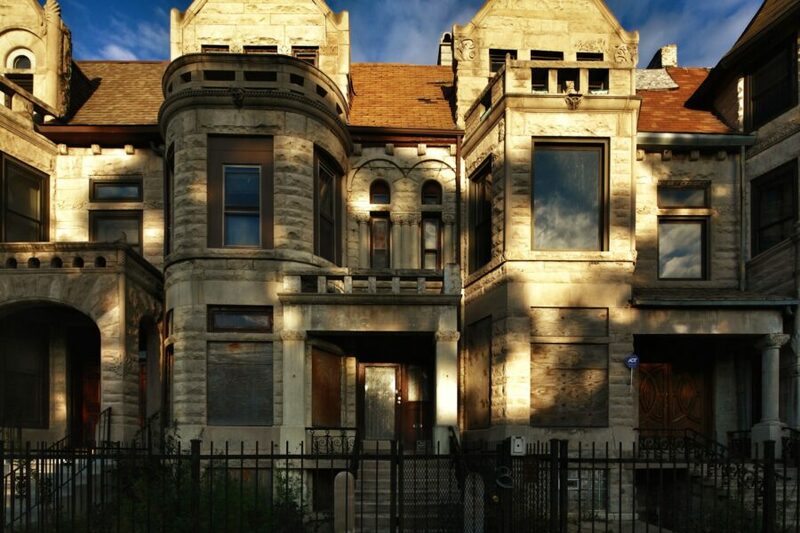 Although some are boarded up, these elegant beauties appear to be in good condition and remain intact as a group. Keep walking north toward 42nd Street, passing by these intricately detailed houses. The house in the center has a unique multi-porthole front tower, and the multicolored brick and limestone house on the right features twisted columns on both sides of the front gable. My favorite structures on this stretch of road lie on the corner of Dr. Martin Luther King Drive and 42nd Street. These two stand tall together like an odd couple who survived tough times with grace and dignity. Both are made of stone, one grey and one brown. On the left, we see a rounded tower that starts on the second floor, with a prominent cupola; on the right, an angular bay window that stands out in front of a stepped front gable on the third floor. They have a similar appearance from afar yet they significantly differ from one another in the details, like a set of fraternal twins. The same view at 42nd Street today. 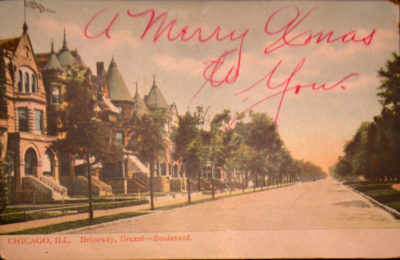 Take a right and head down 42nd Street to see some charming Victorian-era homes. Another Victorian odd couple are these houses. On the left, a castellated greystone with an arched entryway and picture window, topped with intricately detailed metal cresting; on the right, a tall Queen Anne that is unusually symmetrical. 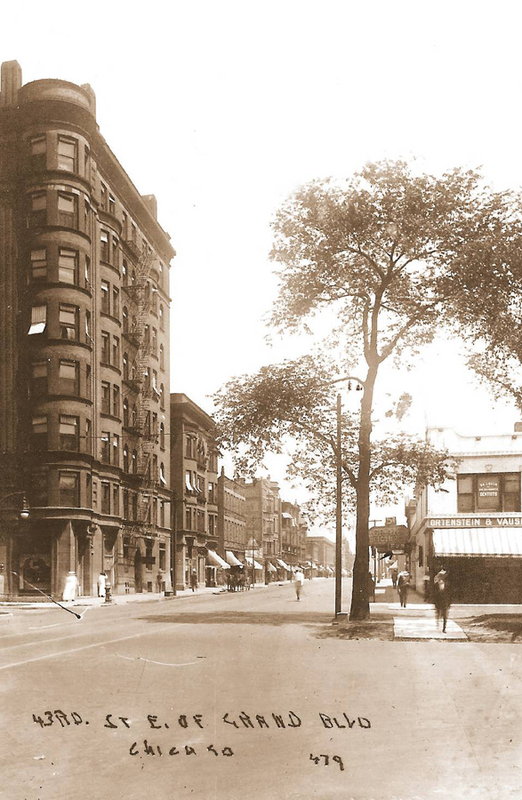 Rounding out Part 1 of this series is this greystone on 42nd Street. It looks like many others across the city, with the exception of the dormer and narrow gable. A small tree growing near the roof line is the only sign of life in this home for now. This seven bedroom home is currently for sale at a great price. 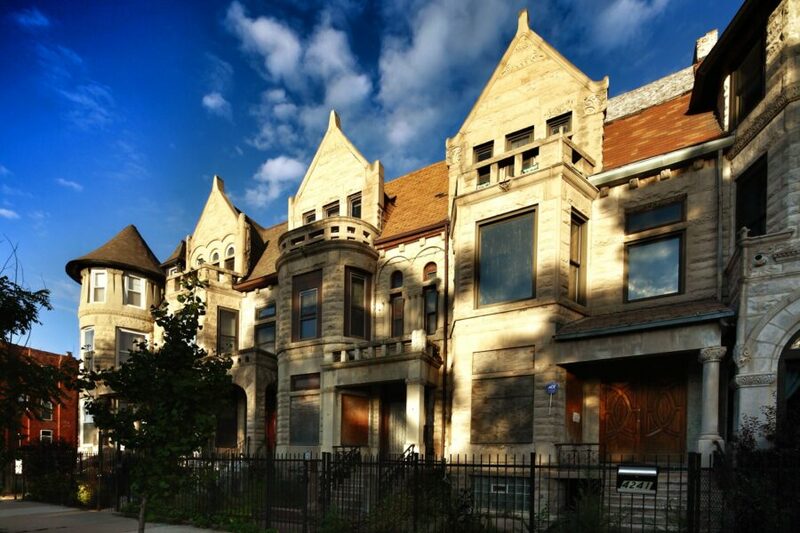 Be sure to check back soon for Part 2 of this series, where we’ll look at an overlooked landmark–the home of a prominent Bronzeville resident who made history in the field of medicine. Love seeing the old photos. Great story John! and eat ice cream waiting for the bus. Hi! 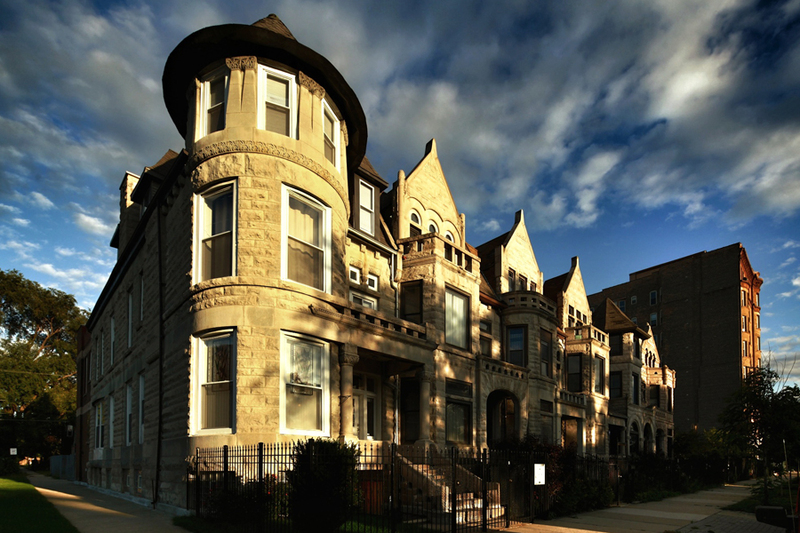 I’m new to the city and have been interested in Bronzeville for a while. 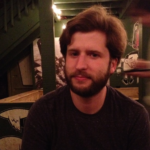 Do you know of anyone that actually gives walking tours of the neighborhood? Thanks.